I'm not what I would describe as a joiner. I'm much happier hanging out on the periphery, taking in a scene rather than creating it. I don't feel a need to be the centre of attention, in fact I'd much prefer to just bask in reflected glory. Up until recently, this is how I lived my life. The thing is, this is all well and good if you've put in years of standing on the sidelines. On the sidelines, you'll find likeminded people who you have time and patience to get to know. You can create little routines and slowly build your spot around you. When you're flung into a new place, this isn't possible. Living somewhere where I knew no-one and no-one knew me, meant putting my hand up more times than was comfortable. Last year was very frustrating, because I kept pushing myself out of my comfort zone to meet people, to build a spot in our community. Time and time again, I felt like just as I pushing through the door it was slamming back in my face. Many, many times I felt completely invisible, just chatting to myself. It was pretty demoralising. I really began to feel that I just didn't fit and possibly might never fit. If I had put in that much effort in Dubai, I would have been full-blown centre of attention with social dates every day of the week. In Brisbane, loneliness was my constant companion. This year, all the seeds that I've sown have finally begun to sprout. All the doors that I've pushed are starting to fling open. Volunteering, class parent, tuck shop, organising, helping out, sports teams. All the things that sent shivers up my spine and are so not "me", are now crammed into my day. Yet, slowly, slowly things are beginning to change. I stop for multiple chats on the school run. People thank me for things I have done and ask my opinion on things. 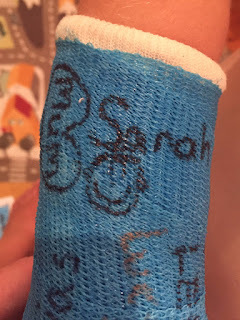 When Darbs broke his arm at school, word spread and I had people texting and emailing to see if I needed help. Some of the people I had never met. Gradually we've become part of the community. We're still the "new" people, but we're not invisible any more. 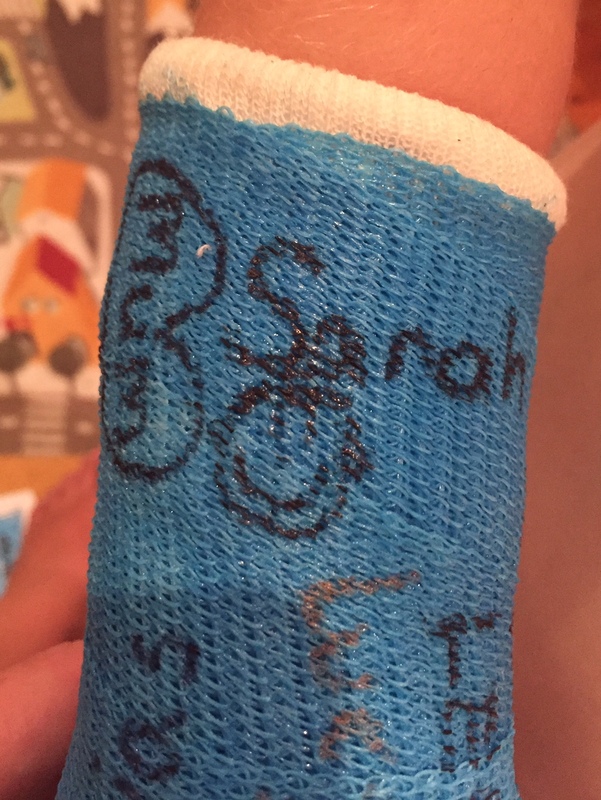 I look at the names scrawled across Darbs' cast, names of people of all ages who've become important in his little life, people who a year ago we didn't know existed. That little symbol alone feels like we're creating something. It would've been easy for me to not step up. To not fight every part of me that hates volunteering and being "that" mum. With no friends or family around us, we had to make an effort to create our community. It's not just about having people to chat with, it's about having people I can call out to as I'm jumping into the back of an ambulance to look after my older kids and know they'll be OK. People to rely on, when family is 1000km and more away. As I walked Lil-lil into school late after an appointment this morning, I saw the school principal for the second time that day, he yelled out to me: "Oh my goodness, I'm going to have to start charging you rent!" Still rolling my eyes at his lame joke, we walked into the office to get a late note, which was handed over before Lil could even utter her name. I guess we really are no longer invisible!